Free Download WIDI Recognition System Professional 4.5 - Convert MP3 to MIDI, WAV to MIDI and edit it! Did you ever wanted to create a polyphonic MIDI tune from any usual audio file? If so, WIDI Recognition System will make your wish come true. This unique piece of software can quickly and effectively convert MP3 to MIDI. You can take any song in MP3, WAV, or Audio CD format and transform it to MIDI in a matter of minutes. The program is able to work with audio files, as well as to capture and convert a tune instantly, as you sing or play. MP3 (WAV) to MIDI conversion may be useful both for fun and for a serious work. For example, WIDI Recognition System will transform any MP3 or WAV file to a polyphonic ringtone for your cellular. Or, if you are a musician, you can use it to recognize score (there are other applications on the Internet that are ready to create and print sheet music out of MIDI files). Professional Edition has TrueTone Editor that allows you to adjust or correct results of automatic recognition in a simple visual way. To make recognition more accurate, the program supports presets for different music types. It is possible to add user defined presets. WIDI Recognition System is also user friendly, it offers step-by-step Wizard mode that will help you to get first results without reading manual. It's good to create midi. Excellent product. great results and easy o understand. i especially like the gui. Even with a solo instrument track, the music was not captured: wrong notes, rhythms not recognized. elaboration. The price is, compared to the output's low quality, quite high. Maybe it could be interesting "playing along" by feeding bird song, or speech to this machine and process the MIDI-score resulting from it. Sorry for the bad review, floks but I am really disappointed by this thing. Efficient and to the point. Exceptionally accurate when using for one instrument. I've use it to transcribe my live flute playing WAV files to MIDI and the results are 95% precise. If it wasn't for the price I would recommend it fully. Review WIDI Recognition System Professional! Able MIDI Editor 1.3 - Professional MIDI Editor at a competitive price to create music and ringtones. Audio To MIDI VST (MAC) 1.10 - Polyphonic Audio To MIDI VST plugin by WIDISOFT for MAC OS X. Audio To MIDI VST (PC) 1.10 - Real-time AUDIO to MIDI conversion with adjustable recognition parameters. WIDI Recognition System Professional 4.5 - Transforms music into its musical notation to convert Audio to polyphonic MIDI. 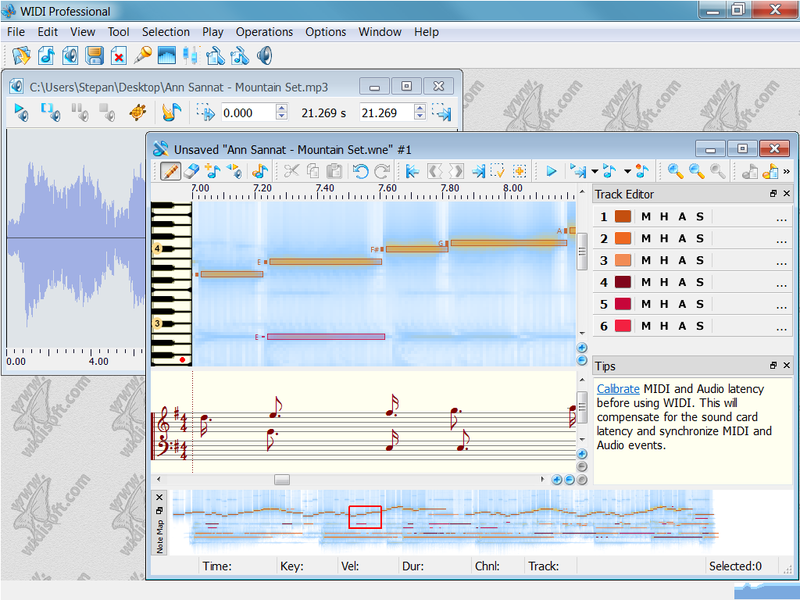 WIDI Recognition System Standard 4.5 - Turn a musical recording into its musical notation and save it to a MIDI file.